Mark Citrin, P.A. is a Florida law firm with offices in Miami and Orlando. 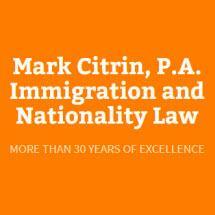 Our practice is limited to United States immigration, nationality and consular law. We pride ourselves in providing our clients with diligent, aggressive and thorough legal representation at a reasonable cost. Our experience includes legal representation before all U.S. governmental agencies and departments which decide whether a person may legally reside and work in the U.S. Our experienced staff also speaks Spanish, French, French-Creole and Russian.